Now that you have noticed (finally) the subject of the stamps, I will make everything crystal clear. 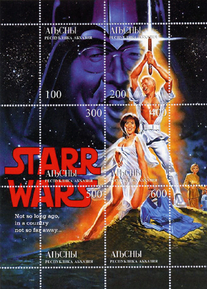 The Clinton Starr Wars stamps are Abkhazian. Abkhazia is a superficially Muslim part of Georgia on the Black Sea shore, a sometimes beautiful but run-down, oppressed and cypressed subtropical mountainous chain of the ex-Soviet marine resorts, nuclear weapon development sites and polluted pebble beaches, populated mostly by the drunk Russian "peacekeepers" whose Kalashnikoffs keep the Georgians from occupying and killing off the relatively few Abkhazians who formally belong to Georgia but react to the Georgians like berserk tyrannosauruses refusing to be reasonable and to submit to the Darwinistic necessity of extinction. Abkhazians call their country "Abkhsny" -- it sounds very much like a loud sneezing, with the strong stress on the last open short vowel, which has no phonetic equivalent in English. Georgia is a "republic" ruled by the ex-KGB dictator Edward Shevardnadze, a man with passable English and graduate college dropout diploma who was the Georgia's obedient Communist party satrap under Brezhnev's regime. Shevardnadze is a Mingrel from Kutayissi, not a true Georgian. Now, being a Georgian "president", he is a Georgian nationalist, and obediently hates Russia to the extent that he contributes to the bin Laden's cause by secretly supporting the Chechen rebels, using American military and financial aid. Joseph Jugashvili (a.k.a. Stalin) was also a Mingrel bandit, from Gori (later a failed poet, later yet a failed priest, and later yet a failed student of astronomy) who successfully robbed banks dressed in chain mail, and spied simultaneously for the Turks, for the Iranians, for the British, and for the Russian tsarist secret police. He thought that the World War I was about Azerbaijani Caspian oil. Maybe he was right. That's why he made a shooting-star career in the Bolshevik Communist party when he managed to eliminate Ulyanov (a.k.a. Lenin the Baldy Syphilitic) who worked for the Germans while avenging his terrorist brother's death on the gibbet by wreaking havoc on Mother Russia. On the other hand, Russian revolution was definitely a Jewish conspiracy orchestrated by Mexican hero Leon Trotsky, Ukrainian anti-Semite anarchist Makhno, and Polish Jesuit Felix Dzerzhinsky, of course. On the third hand, there is in Abkhazia a small tribe of the native black people, "the Abkhazian Negroes", who live there since time immemorial, nobody knows why, and speak unspeakable Abkhazian. Jessy Jackson doesn't know about them: please, don't tell him -- keeping low profile, these black people survived for thousands of years but nobody survives the Caucasian affirmative action. But that's a different story. As the French say about themselves, let us return to our morons. Mingrels are relatives of the Georgians who live in Mingrelia, along the valley of Rioni river, between Abkhazia and Georgia proper. Georgian "republic" officially includes also Lower and Higher Svanetias in the North-West (Svans, in their isolated high mountain valleys, didn't have any contact with the outside world until 1943 when Russians came to fight the German paratroopers there, and subsequently introduced mandatory collective farms out of pure gratitude, because Svans were very helpful by helping both Russians and Germans to enter the Heavenly Kingdom ASAP), Khevsuretia (small nation of the Cro-Magnon stone-hut villages high up in the Northern mountains, bordering Daghestan, the surreal realm of the thousand tongues), Ajaria (the south-western seaboard portion near Turkey populated by the Muslim Georgians who are hated by the Christian Georgians more than anybody else, and such a hate is a serious business because Georgians hate passionately everybody who entered Caucasus later than they did, and that means everybody), pseudo-Muslim Abkhazia on the Black Sea shore, and Muslim South Osetia on the Georgian side of the Great Caucasus Divide, the South Osetins being the same as the North Osetins (historically, predecessors of the Alans), but North Osetia protruding on the other, non-Georgian side of the Great Caucasus Divide. Georgia proper is the westernmost, inner part of the official Georgia in the valley of Kura river, blessed with vine, fruit, cattle, and mustachioed passionate widows. Russian call Georgia "Grouzia" (no one knows why), and the Georgians themselves call their country "Kkhartvehli" (they know why but wouldn't tell). Georgians are the only nation on Earth who lived where they live now since the Neanderthal times. (Armenians, the newcomers to the south of Georgia who came during the first millennium BC from what later has become Macedonia through what later has become Turkey, also don't call themselves "Armenians"; they are "the Hayk" ("True Men" in Armenian), and their country is "Hayastan" ("the Land of True People, or Deutschland"), most of it now being occupied by the Turks who killed millions of Armenians in 1914-1921. Turks are not the God-chosen true people: when they lost their Ottoman Empire, the Great Father of All Turks, Mustafa Kemal Ataturk, worked off the Turkish frustration by making one huge Turkish bloodbath out of defenseless Armenia. Now they don't have any Armenians left in Turkey, so they work it off on the Kurds who fight back and forth between Turks, Saddam, Iranian ayatollahs and Al-Qaeda.) Now, since Abkhazians, being Muslim and all, hate Georgians, have their own distinctive language, and didn't have their own alphabet, they use Cyrillic alphabet, though their language is more ancient than Greek, and has nothing in common with Russian. In principle, Abkhazian stamps are not recognized by the International Postal Union (because Abkhazia formally should be an "autonomous" republic within Georgia). In fact, whatever postal system remains functioning in Abkhazia, it is separate from the Georgian. To boost the pseudo-national income, the pseudo-government of Abkhazia is issuing the pseudo-stamps picturing pseudo-celebrities (anything from Graucho and Carl Marxs to Noseless Jackson, Roman Pope, Madonna, and even lower life forms, down to Hanoi Jane and pale Congress invertebrates). Most of these stamps aren't interesting but some are cleverly designed, and my favorite always has been that Clinton & Monica block styled a la Star Wars. The stamps are designed and printed in Europe (in Austria, in Finland, etc. ), and Abkhazian pseudo-government gets some (small) fraction of the proceeds from the sales of these stamps. I've heard that it is almost impossible to find these stamps within Abkhazia; however, I've seen on eBay several envelopes that went through international postal system from Abkhazia to the US and Canada, bearing Abkhazian stamps. It's a jungle out there. If all this sounds confusing, it's because it is. Caucasus seethes with nations, languages, religions, political intrigues and, most importantly, never-ending vendettas and feuds on personal, tribal, and national levels. Add to this all those Arab terrorists financed by the Saudis and joining the Chechen rebels in the North Caucasus via Northern Iraq, Azerbaijan and Georgia. Add to this Azerbaijanis and Armenians engaged in a mutual genocide that provokes envy and spirit of healthy competition in Jews and Arabs. Add to this the fact that the shortest pipeline route from the richest oil region in the world (around Caspian Sea) cuts through all that Caucasian jumble to the Black Sea and Turkey. Add to this some of the highest mountains in the world, with bad reputation even among the professional climbers (Caucasus is, on average, the steepest mountain labyrinth on Earth). In every isolated little valley dwells a separate tribe speaking its own language. The head of the family often spends all his life in the high stone tower, because several neighboring families must kill him if he ever shows his face outside. The neighbors sometimes don't remember why they must kill him, because the feud goes on for centuries, its cause being no more than a murky legend. Nevertheless, kill each other they do, and with relish. Every little and larger Caucasian nation hates every other little or larger local nation, and engages Russians, Persians, Turks, British and Americans as their allies, changing sides as soon as it becomes necessary for survival. Now you see, why this world of ours belongs to Caucasian race? Because we, the Caucasians, are the most progressive, civilized, and rational people of pure heart and best intentions, bringing instant eternal peace to anybody who stands in our way. The double-president of the United States, William Clinton, wielding high his Shining Cigar, is but the latest avatar of our noblest racial inclinations and breathtaking racial survivability. I solemnly swear that every word above is true, depending on what the meaning of "is" is.